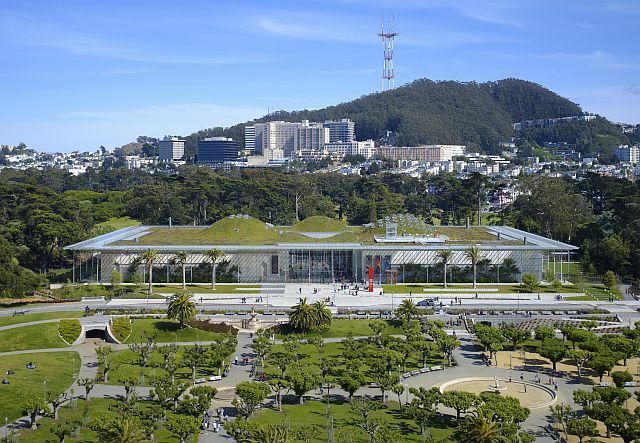 Renzo Piano’s magnificent “all-glass see-through” California Academy of Sciences ([http://www.calacademy.org) in San Francisco’s Golden Gate Park (across from another architectural wonder, Herzog & de Meuron’s de Young Museum) had its eighth birthday three days ago. The group of buildings Piano replaced were constructed beginning in 1916, and were damaged in the Loma Prieta quake of 1989, as was the old de Young/Asian Art Museum neighbor (http://archives.sfexaminer.com/sanfrancisco/art-infused-with-science/Content?oid=2143038). From its enormous storage spaces in several levels of basements for millions of specimen to the “living roof” of 1.7 million autochthonous plants, in biodegradable coconut-fiber containers, the Academy is super-sized, including the central courtyard under its concave glass canopy, the huge Morrison Planetarium (the largest all-digital dome in the world), the four-story high living rainforest , the Steinhart Aquarium for some 40,000 animals and Philippine Coral Reef… and so much more. In contrast, the Academy has a few small spaces, and one of those is the subject of this report, now that we indulged in praise of gigantism. In a small, unnamed third floor gallery, near the bridge that leads to the Planetarium (closed for renovation through Oct. 20), the “Gems and Minerals Unearthed” exhibit (http://www.calacademy.org/exhibits/gems-and-minerals-unearthed) opened today. It’s featuring some 400 geologic specimens, gems and stones equally dazzling, most under glass – no touching! – along with brief descriptions. Items and descriptions are paired with numbers shown in miniscule font, perhaps artsy, but not easy to read. Between a few large pieces, such as the native copper at the entrance to the exhibit, small samples of amethyst and azurite, silver and jade are featured. “The Academy’s minerals and gems have long been a visitor favorite and we’re thrilled to have the opportunity to showcase these specially curated pieces from our world-class geology collection in a fresh, modern way,” says Scott Moran, senior director of exhibits. Curators point proudly at “the enormous diversity of colors, textures, and properties found in pieces both raw and refined.” The exhibit illustrates how geologic forces have shaped and reshaped the planet throughout Earth’s history. From the Stone Age to the Space Age, minerals have helped to advance civilizations, making modern devices like smartphones, solar panels, and satellites possible through use of rare earth elements. The ever-present – and rarely realized – significance of minerals goes beyond their use in the making of toothpaste, lipstick, and other household products: minerals supply essential elements, from calcium and phosphorous, that make bones and teeth strong; metals such as zinc and copper assist with chemical reactions that impact blood pressure, immune system, metabolism, and more. Toxic minerals have their own display case, with the legend that even in small amounts they can cause serious health problems. Apparently, cinnabar (mercury sulfide) is the single most toxic mineral to handle on Earth. The name of the crystal means dragon’s blood, and it is the main ore of mercury. Among the especially striking – and non-toxic – items are azurite, carnelian, celestine, crocoite (“helps you to feel passionately about whatever has your attention” is NOT the Academy’s description), gold of course, copper, tourmaline, vanadinite, and hundreds more.